Outspoken lawyer and former minister, Femi Fani-Kayode once again came hard on the Muhammadu Buhari’s led APC government by alleging that there is a ploy to have Osinbajo appoint Nasir El Rufai as his VP in the event that the president dies. 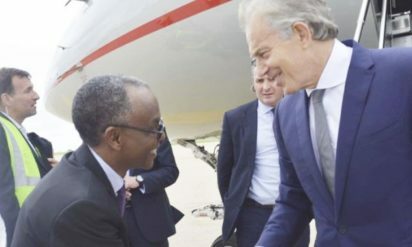 The statement he made using his Facebook account follows the visit of former Prime Minister of Britain, Tony Blair to the Kaduna state governor yesterday. "Whilst the werewolf sleeps in London, Tony Blair arrives in Kaduna where the vampires gather to share Nigeria’s flesh and drink her blood. "When Buhari is being declared dead the plan is for Osinbajo to appoint Nasir El Rufai as his VP. "Tony Blair has come to Kaduna to convey British approval of that plan. "El Rufai is slotted to take over from Osinbajo in 2019 but God will shock them. "When will the British leave us alone? When will they stop manipulating us and interfering in our affairs? "The blood of the Christians and Shiite Muslims of S. Kaduna speaks against … admin..
"They are finished and all their plans will fail. "The Lord shocked Buhari. He will shock this lot too. "Their power is broken and their time is over"